A.B. Shepherd: Blogging from A-Z Challenge - N = New Authors. How do you find them? Blogging from A-Z Challenge - N = New Authors. How do you find them? My friend Jane and I were recently discussing books over a delicious lunch at our local library's cafe. Books are a topic that is often on our agenda when we get together just because we both love them. Of course we do talk about our families and other sundry details of our daily lives too. But this is a topic we come back to repeatedly. She mentioned to me that she has a tendency to read the same authors over and over again and when she goes to buy a new book, she looks for one of her tried and true authors. She'd like to expand her horizons, but she's cautious. Jane and I are quite different in that respect. I love books, and I love some authors, but I really love trying something new! New authors, new stories, new ideas. But that's just not Jane. She likes her comfortable genres and her comfortable authors who have become like family to her. Jane is a busy woman and although she is no longer working at a job, she is in the process of readying her house for sale, and she also is a very talented weaver, knitter, and spinner of wool, in addition to playing Lawn Bowls and just living a very active life with her husband of 30+ years and her three grown sons. She doesn't have a ton of time to read, which means that she's not always willing to try something new just for the sake of trying something new. If she's going to invest her time - and money - in a book, she wants to be SURE it is something she will like. So here is her dilemma. How do you find a new author you KNOW you'll like? The library in the town I used to live in back in the good old USA used to have flyers lying around all over the place that said something to the gist of "Looking for something new? If you like (popular author name) you might enjoy (another author name). "What a great idea, right? It was wonderful! You find the name of an author you like on their list and it gave you another name of someone to try. Fabulous! Limited, but fabulous, nonetheless. They don't have those flyers here at my local library in Australia. 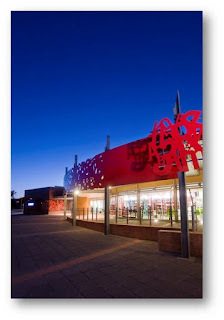 It is a wonderful, new and up to date library which is remarkable for a small country town like ours. Our city council has invested tons of money in it and obviously (and rightly!) believe in promoting literacy and all the wonderful things associated with it. We do have a lovely newsletter that lists new books/products, and we have bookmarks listed by genre with names of authors below, and we even have semi-local authors come to speak at our fabulous libaray (can you tell I am a HUGE fan of our library? ), but sadly nothing that really gives you a recommendation based on your preferences. Sigh. So where can you go when you're looking for a new author? I'm a fan of the website Goodreads. I discovered them about a year ago and I just love them. I swear when I tell anyone about them I sound like I am PAID to market for Goodreads. I'm not - for the record. But I love love LOVE them and everything about them. One of the features they introduced not too long ago is a list of suggestions based on books you've read. It is wonderful! The only problem with this is that you must have read and logged a fair number of books on their site before they have built up enough of a database of what you like to be able to provide you any recommendations. Sadly, if you are not a long time user of the site who faithfully puts in and rates all the books you've read this won't work for you. So where else can you go? I've just discovered another website called Literature Map. On this one you can put in the name of an author and it will bring up a "map" with the names of authors which sort of float around the name of the author you entered. The idea is that the nearer an author's name is to the name you entered, the more likely you are to also enjoy their novels too. The drawbacks? Literature Map doesn't recognize new and independent authors. I'm also told it isn't fool proof. You may occasionally get some matches that seem way off the mark. So how else can you get recommendations for new authors to try? Another idea is just by word of mouth. But what if your friends/family don't read the same authors you like? I guess you are stuck. I think all of these tools are great, but if you are like my friend Jane they just might not help you enough. So tell me, how do YOU find new authors to read if you like being in your comfort zone? Thanks for bringing Literature Map to my attention - that is pretty neat! When I was a librarian at a public library (pre-digital age) we used to make up bookmarks with "If you like so-and-so, you'll love so-and-so" recommendations. Now I notice if you buy a book at Barnes and Noble, they print up a little slip that is similar. Whether they are new authors, or already established authors, I am not sure. These days, authors seem to rely heavily on their reviews on Goodreads and Amazon as a way to be found. 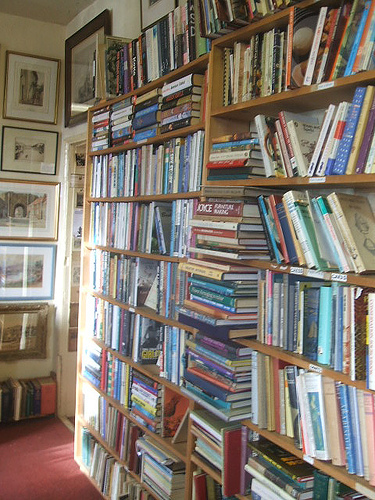 I frequent a little book shop in my town that sells and trades books. 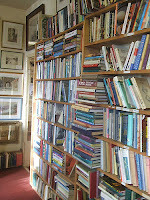 I have been going there for years and the owner has an extensive knowledge about authors and genres and such. I ask her for suggestions and she gives me recommendations and is very accurate. I have enjoyed all of the books she suggests. She also reommends new authors even if there books are not in a genre that I favor. I have many new authors to follow that way. She is my Guru! Book store employees/owners are great for recommending books. So are librarians. How wonderful for you to have such a helpful one who can read YOU like a book Laura! I think you have a great idea though, that when someone reads a book you can state who it put you in mind of. It just needs to be setup. I wonder how easy. As an indie author this really appeals, as I can imagine it would any other indie author. (Furiously thinking on this one). Some of my favorite reads have come from review requests. Repeated requests with good books from the same publisher lead to me telling friends which publishers I like. You and me both Sheila. I've really loved a lot of the books that I've received review requests for. But Jane, isn't a reviewer. Just a reader. And although I've given her some suggestions I just don't feel like I'm helping her enough. There's always the new section at libraries. Just browse for a new book, and if you're not happy with it, it's a library book, so big deal. Also, Kindle lets you preview the first 10% of a book, so a couple chapters - that's more than enough to know if you're going to like a book or not. I go by something totally different - conventions. When I go to a con and talk to authors and they pitch their books to me as a reader, I really get a feel for what they wrote and whether I'll like it. The last 30 books I bought are autographed, handed to me by the authors. And does it work? Oh, yeah. War of the Seasons by Janine Spendlove is the best book I've read in a very long time, and I met her at con. As a bonus, most of these authors are now very dear friends. This week, I'm driving over an hour to say hi to another dear author friend, Eric Wilson. I know people don't have the same amount of time as I do, but there are ways.